SEPTEMBER 2016 45 the growing importance of a global workplace strategy Workplace strategy is a vitally important aspect of companies be- Workplace strategy is a vitally important aspect of companies be- Workplace strategy is a vitally important aspect of companies be- cause it infl uences the entire employee population of an organisation, be it branding, human resources management, real estate, or sustainability. it branding, human resources management, real estate, or sustainability. it branding, human resources management, real estate, or sustainability. Since no two companies are alike in nature, workplace strategies can Since no two companies are alike in nature, workplace strategies can Since no two companies are alike in nature, workplace strategies can never be a one-size-fi ts-all proposition. never be a one-size-fi ts-all proposition. BMC's core values needed to be expressed in both strategic property decisions and day-to-day occupation of space in order to property decisions and day-to-day occupation of space in order to improve the company's overall effectiveness and operational effi cien- improve the company's overall effectiveness and operational effi cien- improve the company's overall effectiveness and operational effi cien- cies. Technology and social/behavioural changes, sustainability, and cies. Technology and social/behavioural changes, sustainability, and cies. Technology and social/behavioural changes, sustainability, and cies. Technology and social/behavioural changes, sustainability, and cies. Technology and social/behavioural changes, sustainability, and cies. Technology and social/behavioural changes, sustainability, and an increasing importance of projecting the right company image, both internally and externally, were other important factors addressed to internally and externally, were other important factors addressed to internally and externally, were other important factors addressed to accurately scope out an effective workplace strategy for the company. accurately scope out an effective workplace strategy for the company. accurately scope out an effective workplace strategy for the company. For the BMC CRE team, this presented an opportunity to drive change For the BMC CRE team, this presented an opportunity to drive change For the BMC CRE team, this presented an opportunity to drive change through the transformation of the workplace. location strategy BMC Software in Pune operated from two premises and more BMC Software in Pune operated from two premises and more BMC Software in Pune operated from two premises and more BMC Software in Pune operated from two premises and more growth led us to source for more capacity. Our workplace review growth led us to source for more capacity. Our workplace review growth led us to source for more capacity. Our workplace review concluded that consolidation to a larger campus environment from a concluded that consolidation to a larger campus environment from a stand-alone building was the right strategy. The Business Bay com- stand-alone building was the right strategy. 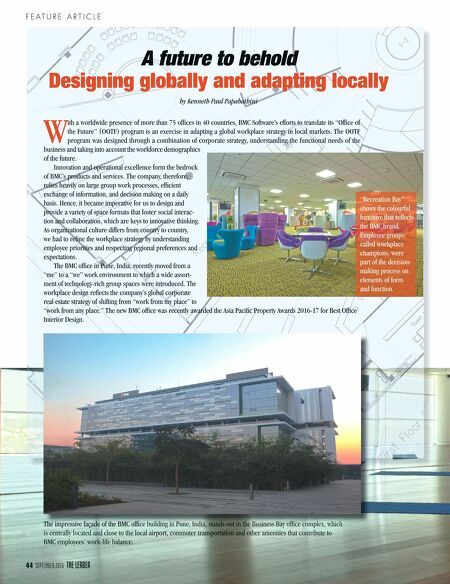 The Business Bay com- plex was best suited for being centrally located, with proximity to the plex was best suited for being centrally located, with proximity to the plex was best suited for being centrally located, with proximity to the plex was best suited for being centrally located, with proximity to the airport, good commuter transport links and excellent amenities, including a airport, good commuter transport links and excellent amenities, including a airport, good commuter transport links and excellent amenities, including a airport, good commuter transport links and excellent amenities, including a airport, good commuter transport links and excellent amenities, including a airport, good commuter transport links and excellent amenities, including a airport, good commuter transport links and excellent amenities, including a airport, good commuter transport links and excellent amenities, including a airport, good commuter transport links and excellent amenities, including a airport, good commuter transport links and excellent amenities, including a airport, good commuter transport links and excellent amenities, including a airport, good commuter transport links and excellent amenities, including a airport, good commuter transport links and excellent amenities, including a airport, good commuter transport links and excellent amenities, including a airport, good commuter transport links and excellent amenities, including a airport, good commuter transport links and excellent amenities, including a airport, good commuter transport links and excellent amenities, including a luxury Ritz-Carlton hotel. The BMC offi ce occupies more than 250,000 luxury Ritz-Carlton hotel. The BMC offi ce occupies more than 250,000 luxury Ritz-Carlton hotel. The BMC offi ce occupies more than 250,000 square feet (23,226 sq. m.) spread over six fl oors in Business Bay, an offi ce complex with over 14 acres (5.6 hectares). Business Bay also provides a vibrant live-work-play environment to its corporate occupants, thus improving employees' work-life balance. occupants, thus improving employees' work-life balance. empowered and mobile workforce Workforce demographics are changing. The population that's Workforce demographics are changing. The population that's entering the workforce – the Millennials – have work habits that are entering the workforce – the Millennials – have work habits that are entering the workforce – the Millennials – have work habits that are drastically different from those of the previous generation. According drastically different from those of the previous generation. According drastically different from those of the previous generation. According to a report by Deloitte, most Millennials (78 percent) are strongly to a report by Deloitte, most Millennials (78 percent) are strongly infl uenced by how innovative a company is when deciding if they want to work there. They prefer workspaces that foster fl exibility, collabora- to work there. They prefer workspaces that foster fl exibility, collabora- to work there. They prefer workspaces that foster fl exibility, collabora- to work there. They prefer workspaces that foster fl exibility, collabora- to work there. They prefer workspaces that foster fl exibility, collabora- tion, and creativity. Empowered Millennials move frequently during the tion, and creativity. Empowered Millennials move frequently during the tion, and creativity. Empowered Millennials move frequently during the Open desking systems and the latest in offi ce furniture create vibrant and collaborative "we" work areas while the occasional private nook nearby allows for a solitary, "me" work experience. "Family lounges" create a warm and inviting atmosphere for group conversations, thanks to couches and fl oor lamps that contribute the feeling of a home's living room. An area set aside for dance/exercise and yoga help keep the BMC employees in shape in a convenient setting.